I grew up in a house where both parents cooked quite a bit. Dad usually manned the grill and made thanksgiving dinner (yes, we grilled our turkey), while mom was more into baking and stove-top foods. While things switched around from time to time, this was generally it. So you can imagine quite a bit of experimenting with food went on in our house. During this experimenting, my mom came up with what is literally the best pasta dish in the world, and yes I have been to Italy before being GF. The dish got so lovingly named by my elementary-school-aged sister and I “The pasta with all the stuff in it”. Our family was not nearly as creative with words as we were in the kitchen. It’s this pasta in a creamy tomato sauce with veggies and bacon. Food doesn’t get much better. Also having Celiac disease will not stop me from enjoying this dish, because I have gluten free pasta! HA! No worries, because I’ll likely make the dish again soon and can update you with a picture when I do. CHOP ALL THE THINGS. No, really, this will make everything so much easier. Chop the onion, mince the garlic, cut the bell peppers into bite-sized strips, and carefully chop the tomatoes with a sharp knife. I’m putting a lot of emphasis on not squishing the tomatoes because the juice from the tomatoes is what cooks down and makes the delicious sauce. Take care of your tomatoes, and those tomatoes will take care of you. Anyway. Cook the pasta until it is just done. Save 1/2 cup of the water, and then drain into a colander. Coat the pasta generously with olive oil. Using a medium-large skillet, cook all of the bacon until it is done but not crispy. 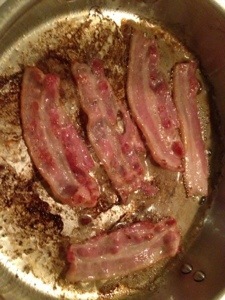 I like to cut raw bacon pieces in half so it’s easier to fit more into the skillet, and they seem to cook more evenly. Once the bacon is done, eat a tiny piece (to make sure it’s not poisonous! gosh!) and then chop it into 1/3 – 1/2 inch size pieces and set it aside. Drain the bacon grease, but do not scrub the residue from the skillet! This will make for delicious juices! Add the onion and garlic to the skillet with about 2 tbsp of the olive oil. Cook on medium heat, stirring to get the bacon residue from the bottom of the pan, until the onions just start becoming soft. Add the pieces of bell peppers and cook/stir until the peppers begin to soften. Stir in the tomatoes and bacon, and add that 1/2 cup of water from cooking the pasta. Cover and turn the heat to low, letting everything simmer for 3-4 minutes. Add in the pasta if your skillet is big enough. If not (like mine) then just add everything into a big pot and combine. Pepper to taste.